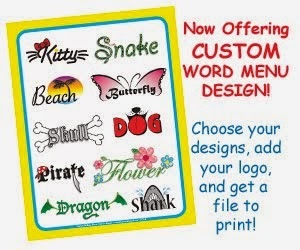 More New Products Just Added! 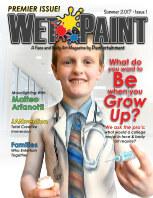 I've just added some great new items to Paintertainment.com! 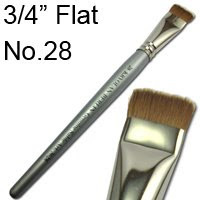 We now have extra large, 3/4" wide brushes available! 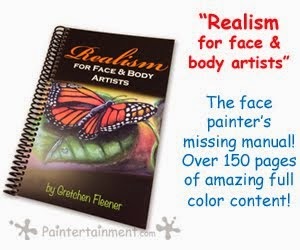 These are great for when you are doing full face designs, and need to cover a lot of area. All brushes on our site are made of high quality, genuine sable bristles. 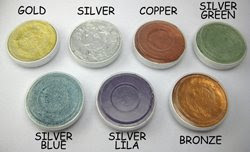 I'm also excited to have just added some great 6-color pallets of metallic Kryolan face paints! These paints have a truly shiny, metallic look. Metallic paints go on a little different than the regular paints. I find the silver is almost flaky when it dries out, but I just use a bit more water when applying it than I do with other paints. 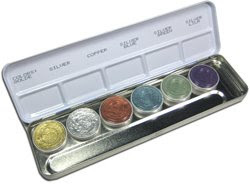 If pallets of several colors are not your thing, we also have several of the metallic colors in the larger, 2.5 ounce cakes. I like to keep one larger silver on hand as it comes in handy for many of my designs! 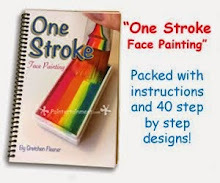 I have had several customers ask me to create step-by-step instructions for my designs. While I am planning to write another book soon that fulfills that very purpose, I thought I'd share one great Halloween "freebie" for you! Here are some instructions for creating a simple jack-o-lantern cheek art design! 1. Draw 3 yellow triangles and a crescent as shown to represent eyes, nose, and mouth. 2. Fill in the shapes with yellow. 3. With orange, trace around your yellow shapes. 4. Add some teeth to the mouth if you like, stroking from the outline into the middle of the yellow. 5. Draw the outer edges of the pumpkin, kindof like a pair of touching parentheses. 6. Fill in the rest of the orange. 7. Add a green stem. 8. Outline the pumpkin and the stem. 9. If you like outline the facial features and add more detail. 10. 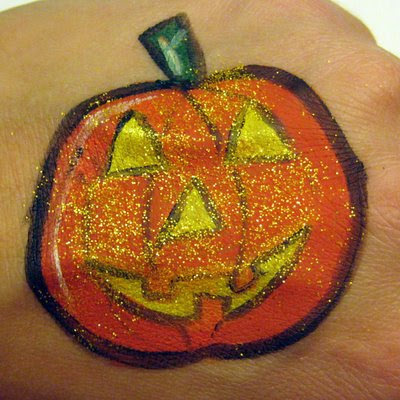 Add some nice orange and/or yellow glitter! 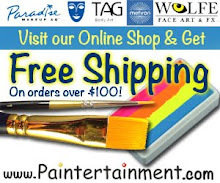 You can find some nice, superfine orange and black glitter here for your Halloween face paintings, as well as paints, Halloween design sheets, and more supplies! 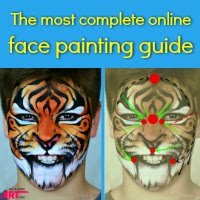 I just finished a busy day of face painting at two events and thought I'd share this cool link that a friend passed on to me. 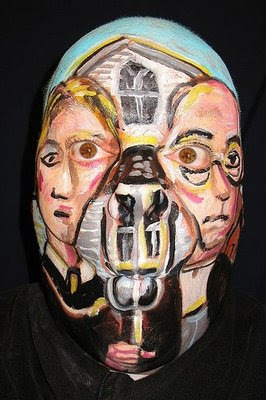 Check out this video of some pretty crazy face painting by James Kuhn! I've been having fun experimenting more lately with incorporating my subject's eyes and mouth into my designs, and it's pretty fun! He even has a book, available here. Great stuff, James! 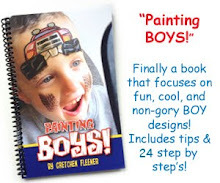 I have recently added a nice collection of great face painting book links to my shopping page...check them out! There are a lot of great books out there. 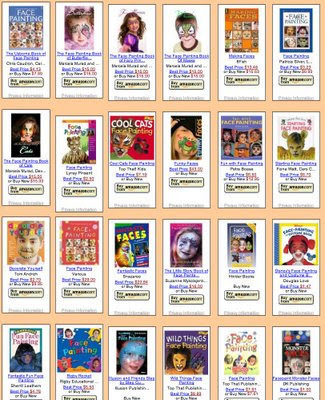 Note that the links on my site for these books will take you to Amazon...I do not sell these books directly but thought that people would find it helpful to have a nice selection all in one spot to browse! Enjoy!